Security across Mangaluru city has been beefed up ahead of the Lok Sabha elections. The police have identified 220 vulnerable polling booths in 93 areas. 501 intimidators were nabbed from these pockets. Central Armed Forces will provide security at 156 among the 220 booths identified as vulnerable and critical; micro observers and video observers have been deployed at the others. A 105-year-old voter from Anna Nagar with firm belief in democracy wants to vote. C Balasubramanian has strong political views and urges people to vote for a candidate who can provide food, shelter and jobs. He also believes that people who take money for votes should be butchered. From shawl clad fictitious Bengali detective, Feluda to Iron Man and from local comic hero Bantul the great to puppet boy Pinocchio, nobody seems to have been spared the election spirit in Kolkata. Political parties in Bengal have roped in pop-culture characters to get their messages across, especially to youngsters. These are all a part of the parties’ social media campaign. CPM has launched comic strips featuring Bengali detectives Feluda and Byomkesh Bakshi whereas Trinamool has taken resort to the iconic Bengali comic hero, Bantul. Tamil Nadu voters demand jobs, health and water. They find the government’s performance on these parameters as below average, according to a survey by Association of Democratic Reforms (ADR). A stack of voter ID cards with postal envelopes were found in a garbage dump in Badarpur in Delhi. The cards seemed genuine and were issued on record to the bona fide voter. The AAP and BJP have now started a blame game over this. A 43-year old cyclist is contesting the Lok Sabha election as an independent candidate from Pune. Anand Vanjape’s election symbol is kettle and major issues on his agenda include pollution and traffic issues. He also wants to promote cycling as a means of transport to keep the environment clean. He has been promoting several issues by going to various parts of the city on his cycle. 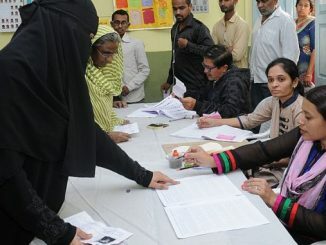 Jammu and Kashmir Thursday recorded an overall turnout of over 55 per cent in the Jammu and Baramulla constituencies in the first phase of the Lok Sabha elections. In some areas there were protests over defective EVMs. The two constituencies house over 33 lakh voters. The Gautam Buddh Nagar administration in Noida hired a motor boat to help voters from the Dalelpur village in Greater Noida to cross Yamuna and reach polling station. An official letter to a boat-owner communicated that his boat has been hired to carry voters on April 11, the polling day. Dalelpur is the only village in Gautam Buddh Nagar but located on the banks of Yamuna towards the Haryana side. The village is a part of the LS segment in Uttar Pradesh. The village has lacked connectivity for years. Three brothers living in Dakshina Kannada will trek through a dense forest on April 18, to cast their votes. The siblings, aged 62, 53 and 50 are the only residents of Kumaraparvatha Hill, 8 kms away from Kukke Subramanya. They have spent their entire lives on the hills and their only demand from the netas is that they protect the eco-sensitive hills and its forests. Even after a month of sustained campaigning by the EC, sensitising voters to exercise their voting rights, urban Hyderabad had few takers. The greater Hyderabad region, including Hyderabad, Secunderabad, Malkajgiri and parts of Chevella fall recorded the lowest voter turnout of 42.24 percent in the state. This indicates that many of the registered voters did not turn up to cast their votes. In complete defiance of EC orders, voters took their phones inside the polling booths in Hyderabad, and clicked pictures with EVMs while casting their vote. A voter posted a video on Facebook showing that his father voted for sitting Hyderabad MP Asaduddin Owaisi. Another voter posted his picture with an EVM in the polling station of Somajiguda, revealing that he has voted for BJP. Voters from various regions of Telangana and Andhra Pradesh who work in Hyderabad left for their hometowns to cast their votes. Bus stations as well as railway stations in the city were crowded with workers and their families leaving to vote. Major roads leading out of the city were also jammed with vehicles. 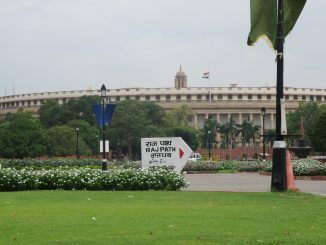 The two states with 17 and 25 Lok Sabha constituencies respectively vote in the first phase of the elections on April 11th. EC rules flouted in Telangana? Just before the commencement of Lok Sabha elections in Telangana, social media was abuzz with hectic online campaigning. Images of candidates and their schemes went viral, urging voters to vote in their favour. As per EC rules, all political parties have to stop advertising, either on electronic or social media, 48 hours ahead of the elections. Yet, both the TRS and Congress parties have been active all along. To promote women’s participation in the Lok Sabha Elections, EC has set up ‘Pink’ polling booth or all-women polling booth in Bal Bharti School in Noida. This polling booth has been set up with only women staff to send across a message of women’s empowerment. EC is banking on an SMS-based system to monitor the polling process in West Bengal. Presiding officers have been asked to send an SMS to a number by 7.15 am which will notify to EC that polling has started. The system is to ensure timely action in remote areas. 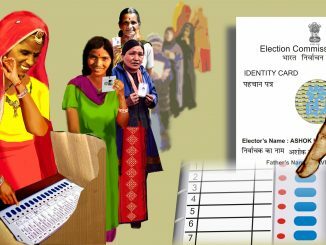 As elections draw closer, the Maharashtra state education department in consultation with the election commission has asked schools and colleges to form electoral literacy clubs with the purpose of spreading election awareness. The north-eastern states of Nagaland, Manipur and Meghalaya will have 9-hour voting due to early sunrise and sunset and other reasons. In the other five states of the region it will be the normal 10 hours of polling. The district election authorities have planned ramps at polling booths, wheelchair assistance and volunteers to ensure smooth voting experience in Hyderabad. Persons with disability will be provided free transport between their homes and the polling station. Congress candidates Urmila Matondkar, Priya Dutt and Shiv Sena’s Arvind Sawant filed nominations today for the fourth phase of Lok Sabha elections in Maharashtra. Matondkar is contesting from the Mumbai North seat where she is pitted against BJP’s Gopal Shetty. A group of rural women, all clad in green clamour and sing, urging people to vote on May 19 when Varanasi goes for polls. The political parties in Varanasi are yet to start a full fledged campaign. But these women in green have already become active to motivate people to vote through traditional folk songs and parodies. Election officials in Hathras district of Uttar Pradesh seized 480 sarees bearing the tag, “BJP Modi Sarkar”. These were being transferred from Mathura to Haldwani. An FIR has been lodged against the vehicle. A bike accessories company based in Chennai came up with a unique plan to spread awareness among voters in the city. With seat covers and helmets flaunting symbols of various political parties, the showroom is attracting plenty of customers. This unique idea is serving the dual purpose of spreading election awareness on one hand and encouraging people to wear helmets on the other. Hyderabad police seized around 5 crore in two checking drives conducted in the city to prevent distribution of cash before Lok Sabha elections. In the first case the police busted an illegal money transfer racket. The second drive seized money from vehicles that were checked by the police. Congress candidate from Bengaluru North constituency, Krishna Byre Gowda organised a flash mob at a mall. This move was aimed at wooing the youth, especially the first-time voters. The dancers grooved to the Kannada version of a popular English number. Mallikarjun Pujari, a candidate of Prakash Ambedkar-led Vanchit Bahujan Aghadi, filed his nomination from Thane constituency. The 48-year-old former Navi Mumbai president of the Rashtriya Samaj Paksha (RSP), belonging to the Dhangar community said his modest background would make him understand the issues of the marginalised sections in his constituency better. Rs 2000 notes mysteriously disappeared from the ATMs in Hyderabad just days before the Lok Sabha elections. Only Rs 500 and Rs 100 notes were available in the ATMs. Scarcity of these notes was largely felt by the salaried class which draws higher denominations as soon as they receive their salaries at the beginning of the month. To curb the use of alcohol to influence voters, the excise department has constituted various teams to monitor recordings of CCTV cameras at liquor shops in Delhi and adjoining districts. Recently, the department had warned shops against selling liquor on the basis of “coupons or token”. They were also asked to strictly follow opening and closing times for their establishments. Strict action has been taken against 1500 people in Pune to make sure that they don’t cause any trouble in the upcoming Lok Sabha elections. According to the Police, as many as 231 people have been externed from the city and adjoining districts for two years. Nineteen others have been arrested under the stringent provisions of Maharashtra Prevention of Dangerous Activities. There will be more voters aged 80 years and above than first timers when Lucknow goes to vote on May 6. The maximum number of people exercising their voting rights however continue to be those aged 30-39 years. The district election officer in Mumbai issues a notice to Shiv Sena MP for allegedly violating the model code of conduct by making crass comments against CPI candidate Kanhaiya Kumar. Sanjay Raut, who is also the editor of Shiv Sena mouthpiece “Saamana” said on Sunday that Kumar should be defeated in the elections at any cost, even if it means that the BJP has to tamper with the EVMs. What happens when you are waitlisted in the MP candidates list? It would have been an anxious moment for anyone but 65-year-old Kirit Somaiya, the out-going BJP MP has been campaigning. However, he is not sure if he will get the ticket this time for his Mumbai north east constituency. Election Commission takes steps to help differently abled voters to reach polling booths. This is in line with EC’s motto – No voter left behind. Pick and drop facilities will be provided for the differently abled on May 12, the day of election. One polling station will be created for the differently abled in each of the 11 districts. Polling officials in these booths will also be differently abled. Officials of the EC flying squad on Tuesday seized 270 voter identity cards from a group of DMK party members in Medamvakkam, Chennai. On being interrogated by the Police, they repeatedly insisted that these cards belonged to friends and relatives and that they were going to return them. Bad news for those who are planning to skip voting in Karnataka and going for vacations. In order to ensure a higher voter turnout for Lok Sabha polls in Karnataka, including Bengaluru, the Shivamogga district administration has hatched a smart plan. All resorts, homestays and hotels in the tourist district have been asked not to entertain guests from constituencies which are going for polls on April 18th and 23rd. Chowkidars might be making headlines and stealing shows this election season, but in West Bengal, the fate of chowkidars and security guards are not too certain. Nearly 3000 security guards lost their jobs in 2018, in the banking sector alone. From humour to satire, we capture and curate the illustrations on elections, doing rounds on social media. In spite of receiving offers from two political parties to create cartoons for their poll campaign, meme maker Sushant Deorukhkar from Pune turned them down. He preferred working independently, making memes for social media. 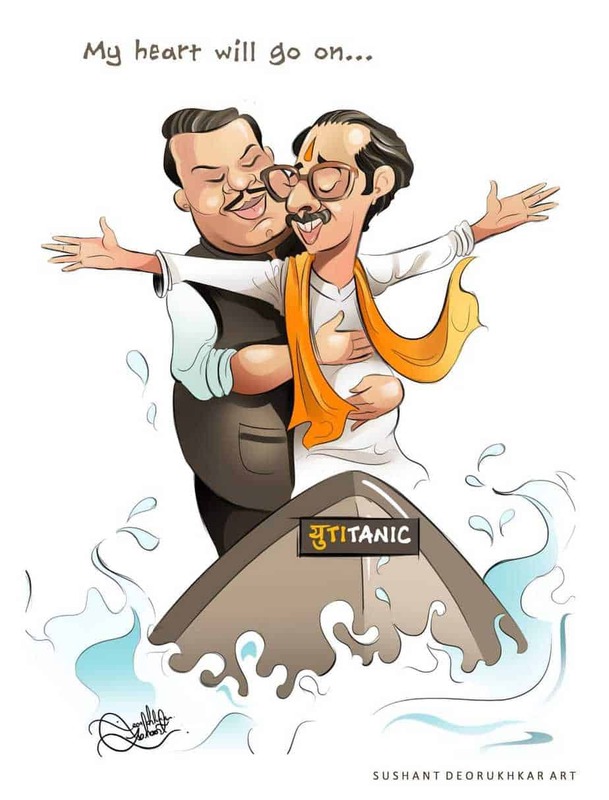 His titanic meme on the Shiv Sena and BJP alliance has been widely acclaimed.